In this project, you create a useful and tasteful ottoman made of two inexpensive trunks that’s perfect for an apartment where extra storage is at a premium, or for anywhere that you want to add a bit of extra seating. It triples as an ottoman, coffee table, and storage area. Cotton velvets, heavy brocades, and even denim work well for this project. If you’re using a napped fabric, such as velvet, or any other raised-textured fabric whose look can change if the fabric is brushed one way or the other, make sure that the nap runs the same way along all the sides of the ottoman for a uniform appearance. For printed fabrics, avoid one-way prints because the fabric on the ottoman’s sides can’t all run in the same direction as the top. Measure the width and length of the two trunks when they’re pushed together side by side; add an extra inch to each for seams. Measure the height of the two trunks, and add 3 inches to allow for 2-inch-thick foam padding, plus 1 inch for the seam allowance. Make a simple drawing, labeling the height, width, and length of the sides, write down each dimension, and then see how many pieces you can fit into a length of 45- or 60-inch-wide fabric. Add the measurements of these pieces together and divide by 36. Iron all your fabric well so that it has no wrinkles or creases. Push your trunks together so they’re as close as they can be, with the fronts with the latches touching each other face to face. Place corresponding pieces of self-adhesive Velcro on the top of the trunks and on the foam, so the foam doesn’t slide, and then place the foam on the trunk. Measure the height and width of the sides and front and back to create your patterns. 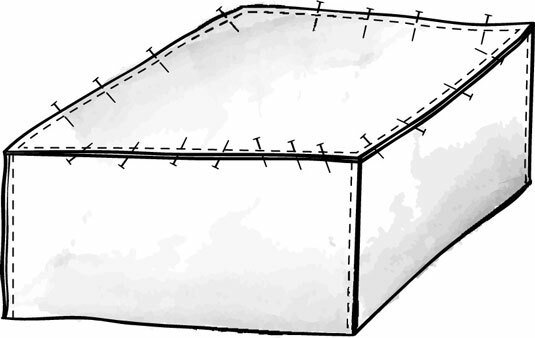 Record your measurements and create the pattern for the five sides of the ottoman, with the foam in place on top of the two trunks, making sure to add an inch to each measurement for the 1/2-inch seam allowance. If you’re not making patterns, just cut your fabric for the top by measuring the width and length and adding 1 inch to each measurement for seam allowance. Cut and sew together your four “long” sidepieces of fabric using a 1/2-inch seam allowance. Matching the corners to the side seams, pin your top to the stitched-together sides, then stitch around the seam to create the slipcover. Hem the bottom of your slipcover using a 1/2-inch seam allowance by folding a 1/2-inch of fabric under and zigzag or straight stitching around the edge. Place your slipcover on the trunks and you’re done!